Couscous has many culinary uses. Cooks can use it in salads, stir into a pudding, top it with sauce, or serve it as a side dish. Best of all, basic couscous is very simple to make. 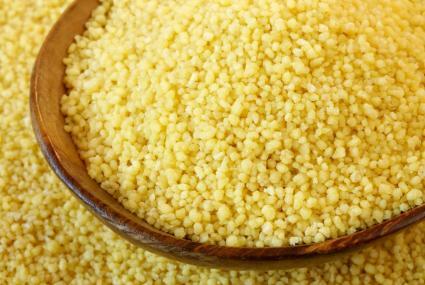 Couscous is small grains of semolina, a form of durum wheat. You can also find whole wheat couscous, made from the whole grain. Both are prepared the same way. Use the basic proportion of 1 cup of water per 2/3 cup of couscous, which will yield roughly one cup of cooked couscous. Measure the water into a medium-sized saucepan with a lid. Remove the water from the burner and stir in the couscous. Place the lid on the saucepan and allow the couscous to sit in the hot water for five to ten minutes, until the couscous is soft and the water is absorbed. 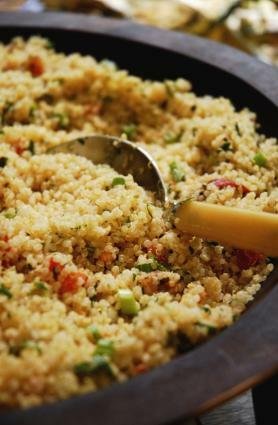 Use this basic, unseasoned couscous in other recipes. Couscous is used in Mediterranean and Middle Eastern cuisine. This cold couscous salad has classic Mediterranean flavors. 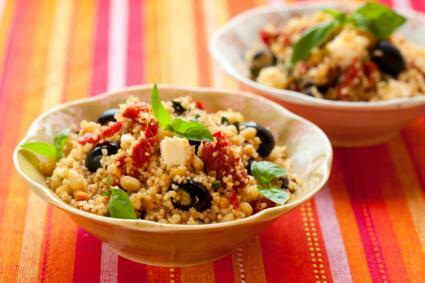 In a large bowl, combine couscous, sun-dried tomatoes, artichoke hearts, black olives, pine nuts, and feta cheese. In a small bowl, whisk together olive oil, lemon juice, lemon zest, garlic, and oregano. Taste and season with salt and pepper. Pour the liquid mixture over salad and toss to combine. Adjust seasonings as needed. Similar to rice pilaf, this warm side dish uses couscous in place of rice. It goes well with chicken or fish. In a large saucepan over medium-high heat, heat olive oil until it shimmers. Add onion, carrot, and green onions and cook until vegetables soften, about five minutes. Add garlic and cook until it is fragrant, about 30 seconds. Stir in chicken broth and bring to a boil. Remove from the heat and add the couscous. Cover the pan. Allow it to sit until couscous absorbs liquid and softens, five to ten minutes. Fluff with a fork. Stir in parsley. Season to taste with salt and pepper. If you've never made couscous before, the basic method of preparation and recipes highlight how quick, easy, and versatile it is. Because it cooks in less than ten minutes, it may just become your weeknight go-to side dish.